There are lots of reasons why home prices keep surging higher and higher around the Puget Sound region. But there’s one pivotal cause that doesn’t get much attention: barely anyone is selling their home. 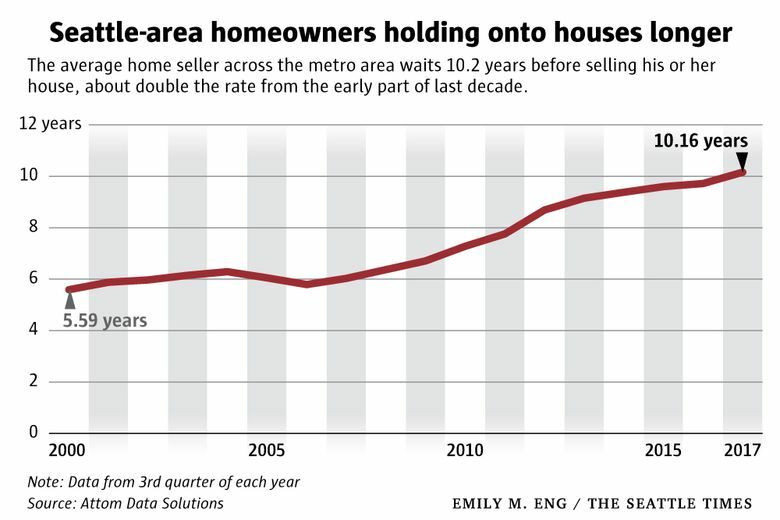 In the early 2000s, when we had something close to a “normal” housing market before the national housing bubble and the subsequent bust, the average home-seller in the Seattle metro area ditched their house after living in it for five to six years. Today, people selling their homes in King, Pierce and Snohomish counties have lived in them for more than 10 years, nearly double the rate from a decade prior. Homeowners hold onto their houses for longer in just four other places — Boston; San Jose; Providence, R.I.; and Hartford, Conn. — among the 40 U.S. metro areas with at least 1 million people. We’re tied with San Francisco, with sellers waiting 10.2 years. That’s according to new quarterly figures out Thursday from Attom Data Solutions, formerly RealtyTrac, which catalogs home sales nationwide. There aren’t many new single-family houses getting built, especially in the city of Seattle — so about 90 percent of sales across the region come from turnover of homes somebody else has already lived in, according to Redfin. That’s why when people don’t sell their homes, the market gets clogged. Total for-sale inventory is at record lows dating back to 2000, while the number of interested buyers keeps growing. The result has been intense competition and prices rising more than 13 percent a year, faster than anywhere else in the country. So why aren’t homeowners selling? Sure, they could get a good profit — on average, home sellers today make about 65 percent return on their original purchase before closing costs, the Attom data shows. That’s the third best profit in the country, behind the San Francisco and San Jose regions. But then what? If you want to remain a homeowner locally, you still have to turn around and buy at today’s high prices, and deal with transaction costs like taxes and realtor commissions on both sales. “That leaves some people stuck,” said Seattle broker Kyle Moss, with Redfin. And if you’re looking at selling your home purely for the profit, it’s easy to fantasize that you can make hundreds of thousands more by waiting a couple more years. Of course, there’s plenty of risk in holding out, as anyone who put off selling during the last bubble knows. Holding onto your home for longer has become a long-term trend that accelerated after the bubble popped a decade ago, and many homeowners who avoided foreclosure had to stay put to avoid a loss. But it’s not just a bubble-burst phenomenon: The average tenure for sellers has grown each of the last 11 years. “I wouldn’t be surprised if we saw this number rise further as homeowners choose to stay in their homes and remodel rather than actively compete for a new home,” said Matthew Gardner, Windermere’s chief economist. Although people here are waiting longer than just about anywhere to sell, the same trend has been playing out nationally throughout this decade. A decade ago, the average seller across the country got rid of their home in about four years; now, it’s about eight years. And we have always been a place where homeowners tend to settle down. Moss said most of his clients look to move to the Seattle area permanently, unlike more transient places like the Northeast or California.